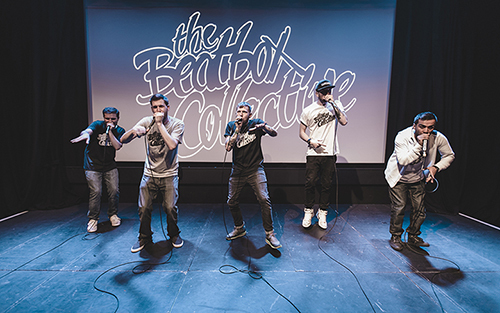 The Beatbox Collective is made up of a cast of the UK’s top beatbox talent. The line-up includes 3x UK Champion Ball-Zee, 2008 UK Champion & World Finalist MC Zani, 2x UK Loopstation and World Finalist Hobbit, World Female Champion Bellatrix, The BFG aka Tobias Hug previously of the multi Grammy award-winning Swingle Singers, UK Champs Finalist Experimental and renowned host and pioneer Bass6. Festival and show appearances include Shambala, Lovebox, Womad, Boomtown, Glastonbury, Bestival, Boombap, Streetfest, Drum Camp, Breakin’ Convention, Secret Walls, World Bboy Championships, Human Beatbox, Festival Fringe Festival and DMC World DJ Championships. 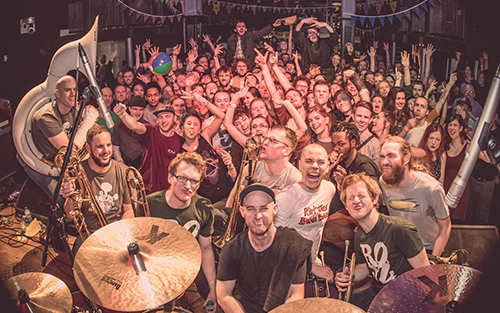 Riot Jazz Brass Band is a 9-piece brass band made up of 3 x trumpets, 3 x trombones, a sousaphone, drums and an MC. They play a uniquely twisted mix of funk, soul, hip-hop and aggressive jazz. The band released their debut album – ‘Sousamaphone’ on First Word Records in 2013 and received wide exposure around the world. The band navigate a minefield of original peace-lovin' aggro jazz, hip hop samples, funked-up favourites, and re-interpreted dubstep and drum'n'bass. FitkinWall straddle the musical worlds of contemporary classical, minimalism and humble electronica. Using harps, moog synth and red box, they spin a web of rhythmically intricate polyphony and interweaving melodies to produce highly focused music. As Songlines recently said, 'it's both widescreen and microscopic, subtle, uncluttered and thoroughly absorbing'. 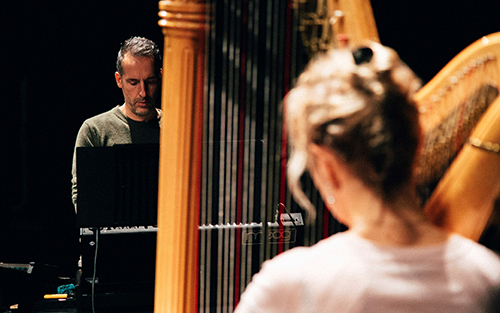 FitkinWall are multi harpist Ruth Wall (Goldfrapp, Kneehigh, Ockham's Razor, Kathryn Tickell) and composer Graham Fitkin (commissions for Yo-Yo Ma, Tate, Royal Albert Hall, New York City Ballet, Tokyo Symphony Orchestra etc). This autumn they will be joined for the first time by guitarist Alex Lee (Goldfrapp, Placebo, Florence And The Machine) to record a new album Shifter, which will be released in 2019. 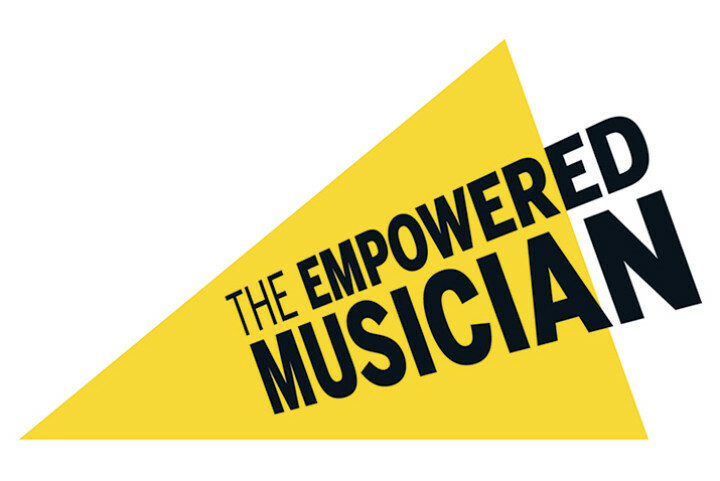 Since graduating from the Royal College of Music, Louise Goodwin has been working as a freelance player with orchestras including the BBC Symphony Orchestra, London Sinfonietta, Royal Philharmonic Orchestra, Royal Liverpool Philharmonic Orchestra, Philharmonic, Scottish Chamber Orchestra and Aurora Orchestra. Richard Cartlidge was the principal percussionist of both the Cardiff County Youth Orchestra and the National Youth Orchestra of Wales. 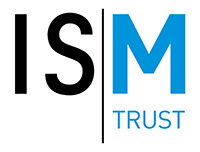 Since graduating from Royal College of Music, Richard has been a freelance player with the Philharmonia Orchestra, BBC Symphony Orchestra, Bournemouth Symphony Orchestra, City of Birmingham Symphony Orchestra, Royal Liverpool Philharmonic Orchestra, London Sinfonietta, Britten Sinfonia, Royal Philharmonic Concert Orchestra and others.